MotoringFile's reporting we'll see MINI's next concept car, a more-butch-than-the-crossover-concept R60-based "Moke" concept that may foreshadow a coming production version, unveiled at next month's Detroit Auto Show. 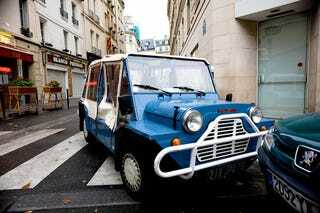 The folks over at BimmerFile reported last month Mini would bring the "Moke" concept, which they described as sort of like a small Jeep Wrangler and known internally as the SpaceBox, to an undetermined auto show in 2010. "The Moke will have a more rugged off-road-like appearance and will feature MINI's upcoming ALL4 AWD system that will be optional on the R60 Countryman. The concept, if well received, could go into production as soon as 2012/2013 with the drivetrain and most of the interior being carried over from the R60."